ROBILLARD Flight Lt. Larry. Among 'Johnnie' Johnson's keen and skillful Canadian pilots was this small, wiry French-Canadian from Ottawa. He was shot down over France in 1943. However, with his fluent French and the help of the Resistance, he managed to get back to England. 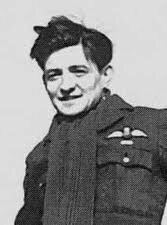 He received a hero's welcome when he returned to France to continue the fight, leading a section of 443 Squadron of Johnnie's 144 Wing following the Liberation.